Federated search is one of the new features of Microsoft's Windows 7 operating system. The feature integrates the option to search external data sources from within Windows Explorer in the same way a local or remote search is run. All you need to do is pick the search provider, e.g. Bing, and run the search. Results are returned in Windows Explorer directly. Federated search in Windows 7 is enabled through the Open Search standard with a good dozen connectors for popular services like Flickr, Youtube, Google or Yahoo already available for download. One of the latest additions is the Bing federated search connector which adds the option to perform Bing searches from Windows Explorer. Bing Federated Search Connector comes as an osdx file that needs to be executed after download. 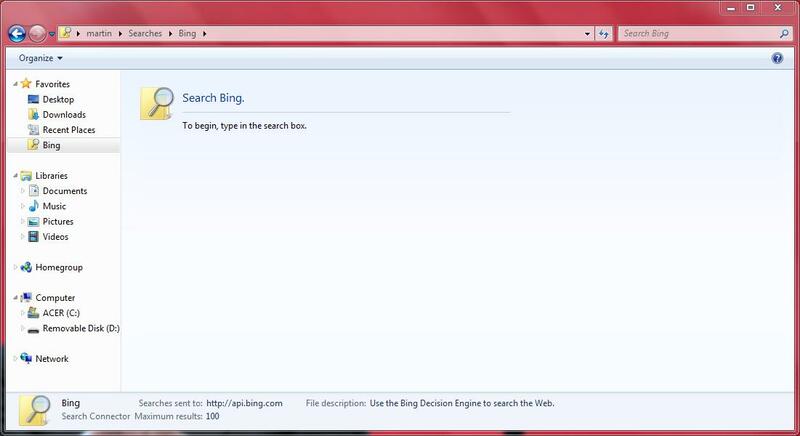 Windows 7 will automatically install the Bing search connector which becomes available in Windows Explorer afterward. The search provider is listed under the Favorites menu on the left sidebar. A search is performed by typing the search phrase into the Windows Explorer search form on the right header of the window. Search results are then displayed in the Windows Explorer window from where they can be opened and accessed. Additional federated search connectors for various online services are available at Redmond Pie. The easiest way to access Bing search whenever you need to is to open its path in Windows Explorer directly. All known searches are listed under C:\Users\username\Searches. Just select Bing from there or open the Bing search option directly C:\Users\username\Searches\Bing instead if you prefer that. You also find the search connector listed under Favorites on the left sidebar where it is also easily accessible. 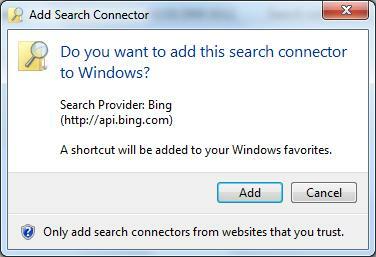 Federated Search Connector is a new feature of Windows 7 that adds Internet search options to Windows Explorer. This article reviews the installation of the Bing Federated Search Connector.